I live for October in Oregon; that heart of autumn, when flora and fauna do their best dance - that holds the most magic. The next morning, I was at the door of Garibaldi Charters at 6:30 sharp. I'd been daydreaming about hooking into one of these giant deep reef lingcod - available only in March and October. Along the way, we took turns pulling the crab pots, which were bursting with big, meaty Dungeness. I live for October. Yes, summers in Oregon are spectacular. And I grew up with Mt. Bachelor in my backyard, so I know that winters here can be epic, too. But for me, it’s that heart of autumn – when flora and fauna do their best dance – that holds the most magic. Fish run, leaves turn, and chanterelles peek out to greet the first rains. On the Oregon Coast, October is nirvana. So I found myself in Garibaldi with a plan: complete a fall culinary trifecta in one weekend. I had two days to catch King salmon, deep reef lingcod, and Dungeness crab. I had the menu in my head before I even started packing. 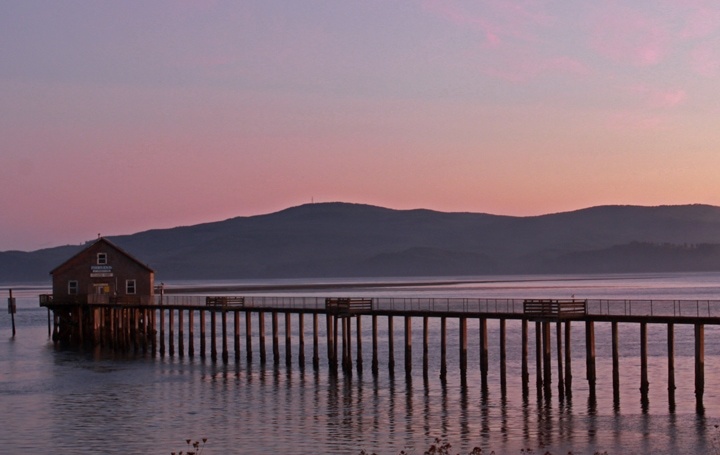 When I arrived, the setting sun was just starting to paint Tillamook Bay. The pilings of the old Coast Guard boathouse cast long shadows, as did the crab pot ropes hanging from the pier. I checked into the Garibaldi House Inn, laid out my gear on the second bed, and called it a night. The next morning at 6:00 I grabbed breakfast to go from the really nice buffet at the hotel and headed a half hour north to the quaint town of Wheeler. There I was to meet Daniel St. Laurent, an incredibly meticulous and knowledgeable guide who’s spent his entire – if not relatively young – life pursuing fish. 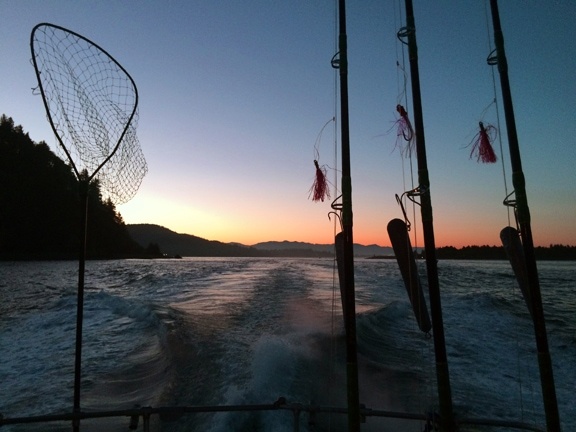 The target: King and Coho salmon on Nehalem Bay. I boarded Daniel’s boat, an immaculate metal sled with comfortable swivel chairs and poles at the ready. I settled into my spot and began the mental pacing. It was still dark, but I could already hear the distinctive sound of large fish jumping and rolling. They were teasing us, and I was ready for the challenge. We began trolling not far from the dock, and within 30 minutes, it was “fish on,” and then another and another in rapid succession. Unfortunately, my pole remained still and I watched as the three others on the boat landed a nice King and two Coho. As the sun began to rise, we moved from near Wheeler out toward “the jaws,” where ocean and bay meet. Finally, my pole buried and I stood to take my position to fight the fish. Out here, the rolling tide makes it feel a little like reeling in a seat cushion while standing on a swiveling waterbed. I had three thoughts burning in my head: don’t fall down, definitely don’t fall in, and don’t lose this fish. 15 minutes later we pulled in my prey: a nice, bright Coho. Total adrenaline rush. By afternoon, we’d added a few more fish to the box, and the weather had become shorts-and-t-shirt appropriate. What a day! The next morning, I was at the door of Garibaldi Charters at 6:30 sharp. Today would be all about lingcod and crab. I boarded the Norwester and met deckhands Joann and Willie, a husband and wife combo both phenomenally friendly and helpful. It’s a 20-mile haul out to the deep reef, and the two-hour ride was a bit rough. We dropped crab pots along the way and continued on. When you’re daydreaming about hooking into one of these giant deep reef lingcod – available only in March and October – two hours is an eternity. And the best sound you can hear is when the captain slows the engine, signaling you’re at the spot. I jumped out of the cabin and assumed my position. The poles are heavy duty, and so is the bait: a simple 20-ounce torpedo weight with a dual hook. 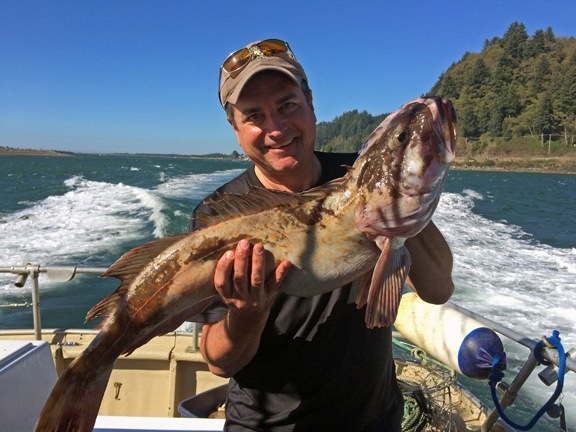 Lingcod are cranky, and they strike because they’re mad, not necessarily hungry. The idea is to get that weight right in front of their face, 350 feet down. It only took a few drifts for me to feel the distinctive tug, and the battle began. Lingcod live on the bottom, and they prefer to stay there. So pulling up a 20-pounder farther than the length of a football field is both exhilarating and exhausting. I repeated my catch an hour later, and after 45 minutes of jigging for rockfish in shallower waters, the boat had its limit and we headed back to shore. 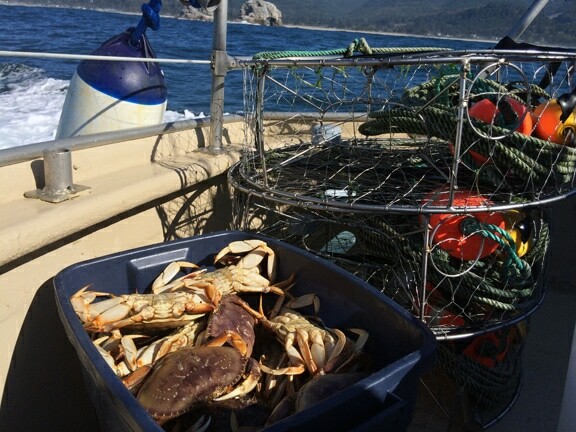 Along the way, we took turns pulling the crab pots, which were bursting with big, meaty Dungeness. I headed for home with a bursting cooler and a wonderful problem to solve: would it be salmon, lingcod or crab tonight? The answer was easy: all three. Oregon Bounty Manager Greg Robeson was born for this job. A fifth-generation Oregonian who grew up in Central Oregon, food was always part of his recreation, whether hunting for wild asparagus, baking with his mom, or cooking family meals to avoid doing farm chores (yep, that’s right, Greg used to live on a pig farm). In college, full menus from the makeshift kitchen in his dorm room became somewhat of a post-midnight legend. In the mid-1980s, Greg’s work in public relations and marketing and penchant for volunteering introduced him to the pioneers of the Oregon wine industry and the leaders of Portland’s culinary evolution. At the time, the concept of fresh-from-the-farm cooking (led by another guy named Greg – Higgins) was just being planted. Working with some of Portland’s top chefs as clients and through volunteer projects, Greg watched and learned. It helped hone his passion for food with some actual cooking skills. Today, he cooks nightly for his wife Kelli and two year-old son Milo (who already has his own chef jacket and toque). Of all the pro bono work he’s done, Greg’s proudest moment was convincing Alice Waters to come to Portland for a fundraiser to build a vegetable garden at an inner northeast Portland school. In addition to the Oregon Bounty project, which consumes half of his year, Greg is president of Robeson Communications, a firm providing a full range of advertising and marketing services to clients in the Pacific Northwest. His culinary clients have included Archery Summit Winery, Carlton Farms, Domaine Serene Winery, Henry Weinhard’s, Oregon Dungeness Crab Commission, and Seafood Oregon. If he can be allowed to brag a bit, in 2006 Greg’s work on behalf of Oregon Bounty was recognized with PRSA’s highest national honor, the Silver Anvil. Then again, he’d just as soon be thinking about what to make for dinner tonight.